Finally! Dead Space is one of my favorite franchises of the past few years. 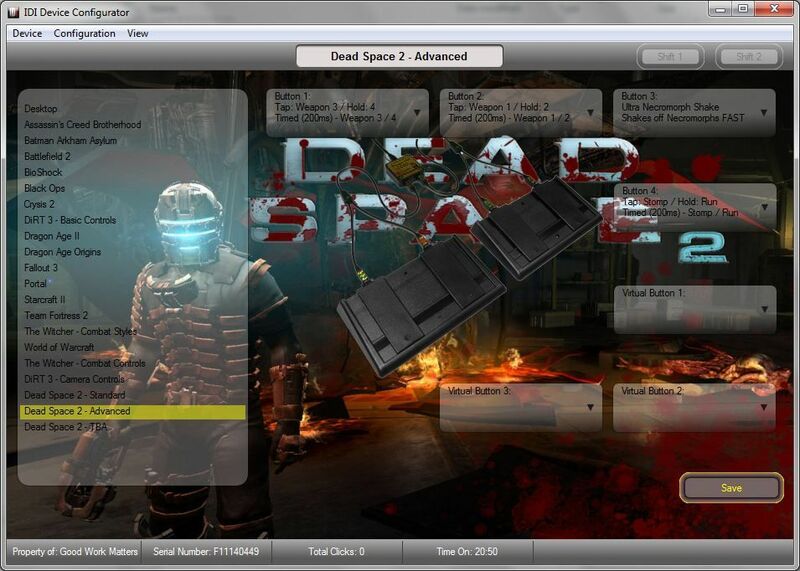 The sheer terror, the extreme ammo scarcity on Hard difficulty, that pressing need to shoot necromorphs in the biceps, and the insight to build a shooter without a traditional heads-up display — Dead Space offers a new twist on an old, old theme. 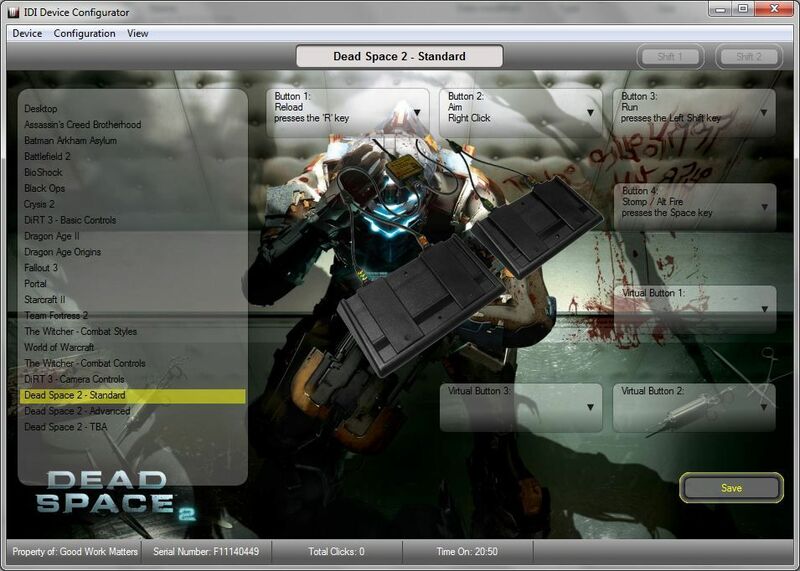 Dead Space 2 uses a relatively conservative control scheme: standard FPS controls (although it’s technically a 3rd-person shooter) plus a few abilities like stomp, run, telekinesis and stasis. It also is another game to embrace the concept of an “aim” button (it’s not just for sniper rifles any more) that seems to have popped up in the last few years, commonly seen in Call of Duty games, for example. Let’s get to work. 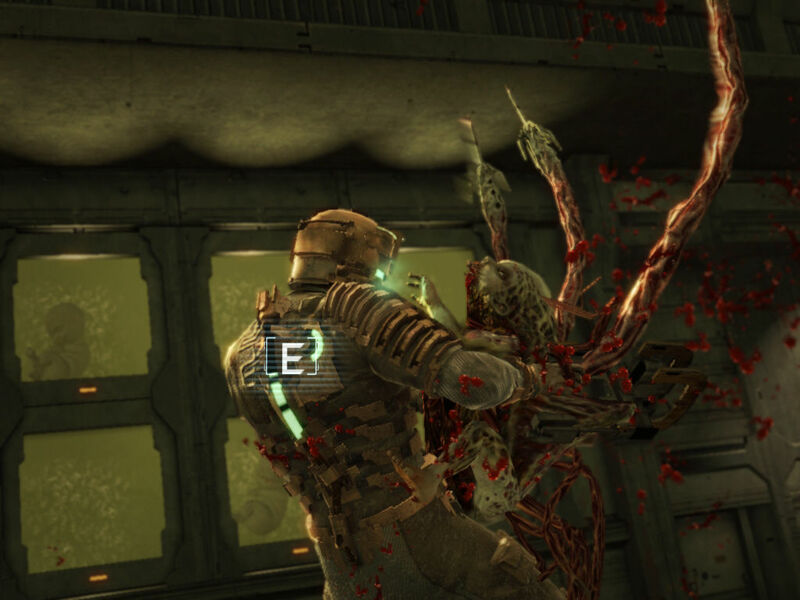 Dead Space is a gory and visceral game, and nothing exemplifies this fact like stomping in a necromorph’s head until it bursts. I don’t see how I could possibly refrain from mapping ‘stomp’ to the pedal. Let’s pair ‘stomp’ with ‘run’, especially since the two commands are used mutually exclusively (have you ever tried to stomp and run at the same time?). Let’s set these two commands to a pedal, say, the left one. Both of these commands are foot-centric, so it’d be fitting if the other pedal controls actions executed by hand. Since Dead Space uses the aforementioned ‘aim’ button, and that’s always worth holding down for long periods of limb-blasting time, I think it deserves a spot on our ‘Hands’ pedal. Let’s pair this with reload. Have you stomped a necromorph’s head today? I hope so. Now let’s take advantage of the more advanced functionality on the Fragpedal. All the commands in this profile were built in the Macro Builder, accessible from the button configuration screen. The macros are of two types: Timed Press and Press-Release. Do you experience symptoms of itchiness, foul odor and fear of commitment? Introducing the Ultra Necromorph Shake macro. Activating this macro sends ‘E’ fast, real fast — approximately every 10 milliseconds. Use it when you feel that the good folks at Visceral Games just haven’t given you enough ammo, and you want to take out your frustration on one of the smaller varieties of necromorph. The shake action starts as soon as you press the assigned button and doesn’t relent until you release. Let’s pair Ultra Shake with a Timed Press macro. Rather than place stomp and run on different buttons on the same pedal, as we did in the first configuration, we can actually squeeze them onto a single button. On a quick tap, we’ll send ‘Stomp’ (space). Once the button has been 200ms, the macro will send ‘Run’ (pressing the Shift button), and when it is finally released, you’ll stop running (releasing the Shift button). If you’re interested in the nuts and bolts: timed press macros can detect three different press durations: tap (ultra fast), release after a brief press (not quite as fast), release after a long press (the longest duration). The time thresholds can be changed easily in the macro builder when you create the macro. All of the timed macros in this profile only use two time switches, “tap” and “long hold,” and the threshold is set at 200ms, or one fifth of a second. A 200-ms requirement to activate the “long hold” command is long enough to ensure that it won’t be accidentally triggered by a simple tap, yet neither will you have to wait long for the “long hold” command to fire. With one pedal spoken for with Ultra Shake and Timed Press: Stomp / Run, let’s use the remaining pedal to change weapons. Of course, Dead Space uses four weapons at a time, so they’ll fit nicely on two Timed Press macros. Let’s use the same timing threshold as before, 200 milliseconds. On one button, a tap switches to Weapon 1 (‘1’), and a long hold brings Weapon 2 (‘2). On the other, a similar Timed Press macro but with (3) and (4). This concludes our lesson today. Now, don’t forget to pack your stasis recharges and don’t leave home without a full clip of line racks. 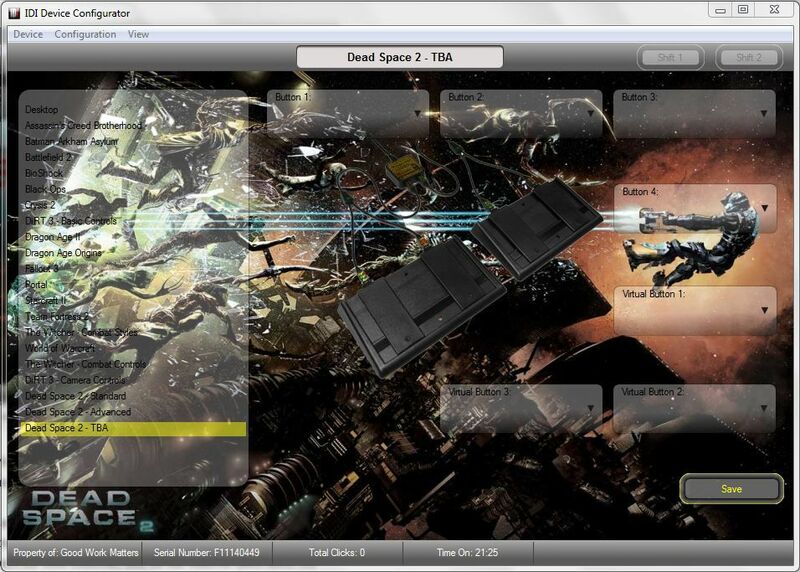 The Dead Space 2 configuration pack used in this post is available now! Limp on over to the files page to grab yours. The content pack includes the three harrowing background skins seen here, support for DS2 controls, and all the macros used here. No necromorphs were harmed in the making of this blog entry.